Dimensions 9" x 4.5" x 4"
Type High level radiation meter - ionization drum. The Victoreen CDV-715 is a high level radiation survey meter. It is the most common meter available, (567,457 manufactured) and also the least expensive (about $25 - $50 as of this writing). It is also, as a high level meter, the least sensitive. Because of these factors, it is widely disparaged, which is unfair, and far from universal. In a nuclear emergency or disaster, this is the meter you want to have. This particular example is the model 1a. I paid $25 for it at a ham radio swap fest. These were typically stocked in government fallout shelters, generally with a dosimeter kit, and often with a more sensitive CDV-700. The CDV-715 was also sold retail. I have a copy of an ad to the left. The listed price of $49.95 is about $150 - $200 in today's money. Presently you can pick up a surplus unit for $25 - $50; but the prices will probably go up. Right now there is a glut of surplus Civil Defense gear on the market, due to FEMA updating or decommissioning a number of our old shelters. I love the last part of the ad, where it says "At leading department and specialty stores." Imagine being able to walk into the local Sears or Target store today and by a radiation meter. This is not a Geiger counter, though it is often mistaken for one. The CDV-715 1a uses an ionization chamber to detect gamma rays. A true Geiger counter gets its name from the Geiger Mueller tube that it uses as a radiation detector. A Geiger counter, is able to detect lower rates of radiation; but is not as good at measuring dose. Most are designed to also detect beta radiation. The Civil defense radiation meter that is a true Geiger counter is the model CDV-700. The model CDV-715 1a, measures gamma radiation only, and does not measure alpha, beta, or neutron levels, though ionization chambers are capable of measuring beta and alpha. The 1b model is also a gamma ray only meter. The earlier CDV-715 was also able to detect beta radiation; but I have never actually seen the original 715 model. The older CDV-720 was also able to detect beta, though it had a movable beta shield to block these rays for gamma only readings. The CDV-715 1a is permanently shielded from beta, for reasons that will be addressed further down. The four ranges of the CDV-715 are 0-0.5, 0-5, 0-50 and 0-500 roentgens/hour. The unit is considered insensitive to radiation levels below 0.1 roentgens/hour. Such radiation levels are rarely encountered, making this the least satisfying radiation meter for the hobbyist to own, since any visible reading would only occur during a nuclear disaster. On the other hand, during an actual nuclear disaster, this is the meter your would want, since the more sensitive (and more expensive) CDV-700 would be overloaded and thus inaccurate. The CDV-700 is one thousand times more sensitive that the CDV-715. This might make you think it is the better choice; but more sensitive is not always better, as anyone who has ever tried to observe a solar eclipse through a telescope will tell you. It might be well to look at just what normal radiation levels are, and at what constitutes a dangerous level of exposure. The CDV-715 reads levels between 0.1 Roentgens per hour, and 500 Roentgens per hour. Simply put, 500 Roentgens an hour will quickly kill you, while 0.1 Roentgens an hour will not. The main page of this section has a graph showing lethality of radiation over time. Roughly speaking, continuous exposure to a level of 8 REMS per hour will make you sick in one day, and kill you in three. Continuous exposure to 1 REM an hour will not even be noticeable in a day, will make you sick in a week, and has a 50/50 chance of causing death after a month of continuous exposure. Continuous exposure to levels of 0.1 REM, basically the lower end of the scale on this unit, will require four months of continuous exposure to cause noticeable illness, and twice that to present a serious possibility of death. At even the lowest dangerous exposure levels, the far more sensitive CDV-700 overloads, and shows a reading of zero, a dangerously low false reading. The difference between the two methods of detecting radiation is that an ion chamber, as used in the CDV-715, measures charge, while a Geiger-Mueller tube measures the number of ionization events. This gives an ionization chamber a number of advantages of the Geiger tube. An ionization chamber does not degrade with use, the way a Geiger tube does. So this meter will keep longer in storage than a true Geiger counter. More details will be given in a section below. There are only two controls on the face of the unit, making it quite easy to operate. A single switch selects the range in fractions or multiples of Roentgens. It also turns the unit off, and performs a circuit check. A small dial zeros the unit. The circuit check only verifies that the various components of the unit are functional and within proper operating range. It does not verify accuracy or calibration. To calibrate the instrument, you need a radiation source of known magnitude, and must calibrate with the meter at a set distance from the source. Complicating this, is the fact that most radiation sources are rated according to a unit called the Curie, or a more recent unit called the Becquerel. Roughly speaking, a 1 curie source of radiation will give 4 RADs of exposure at a distance of 18". This is a good amount to use for calibration, since readings closer than 12" from the source may be inaccurate. Now for the hard part - 4 RADs is a lot of radiation in non disaster situations. This is about 200,000 times the normal 23 microrem in normal background radiation. As a matter of fact, continuous exposure to 4 RADS for a period of a few days would make you sick. You might be able to make due with a source of about a tenth of a Curie; but such sources are very expensive, and highly regulated. The highest level radioactive sources readily available have about 10 microcuries - a hundred thousandth of a curie, and are useless for calibration of high level meters. There is no easy solution to do it yourself. Professional calibration costs about $100, and should be done every 4 - 6 years (some say every year). The photo to the left shows the unit open. It is powered by a D cell battery, and has a single circuit board. The large gray drum is the ionization chamber. Note the small brown desiccant pack in the bottom of the case. Also notice the channel along the whole outer edge of the case, and the rubber seal in this channel. This is necessary because the ionization chamber is open to the air, and is very sensitive to humidity. Previous versions of this meter had openings of windows so that beta measurements could be made, but this made these units far too susceptible to moisture damage. An ionization chamber is a very simple device. 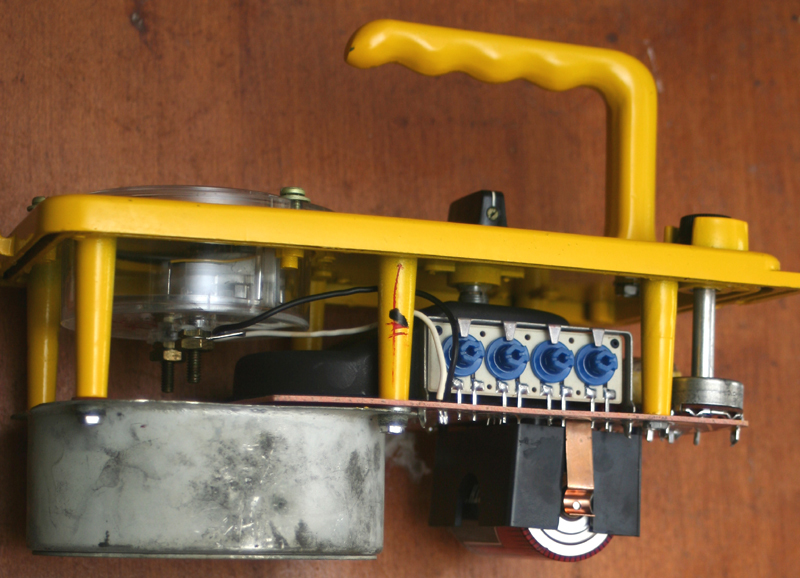 it is so simple that you could easily make one yourself, or modify an existing unit. There are instructions available on how to make such a chamber from a coffee can and a piece of copper wire. What the chamber actually measures is the difference in charge between the center wire and the surrounding drum. As radiation enters the chamber, the gasses become better conductors and the charge difference decreases. A number of different gas mixtures may be used inside, including standard air. This particular ionization chamber uses normal room air, and is not sealed. Ionization chambers can deal with much larger amounts of radiation than Geiger tubes, and do not become desensitized with use. The one big downside to such a chamber is that it is very sensitive to moisture, and must be protected against water. This is why the CDV-715 is always hermetically sealed and contains a desiccant. Water inside the drum will allow the unit to conduct and will give false high readings. Water contaminated units may be restored by removing the ionization chamber drum, drying it in an oven, and then replacing the desiccant. Recalibration will then be required. Because these units are so cheap and available, a number of people have modified the chamber design, cut windows in the case to allow in alpha and beta particles, and in general experiment to see what they can make of this unit. Lifting two latches opens the rubber sealed case. Six screws hold the circuit board and ionization chamber in place. Thus, the units are easily services, and even have a schematic pasted to the inside of the case. This circuit is simple enough, consisting of a high voltage transformer to charge the ionization chamber, and then a circuit to measure the voltage. A few capacitors and resistors, keep the circuit at the proper level, with some variable caps used to calibrate and zero the unit. This is a look at the left side of the unit, showing the calibration controls. The four blue plastic dials serve to calibrate the instrument on the four sensitivity settings. The usual procedure for calibration at a facility is to lock the unit into a brace at a known distance form a source of known intensity. Calibrating at all four meter ranges not only zeros them out, but also insures that the readings are proportionate along the whole range of the unit. Inability to calibrate at all ranges, and to have the unit hold calibration while different ranges are being calibrated is an indication that either a capacitor or resistor needs replacement. These are simple fixes because of the open construction of this unit. Because nothing is readily available in this high range, these days, a CDV-715 might be worth the expense of repair and calibration. Because of their present low cost and high availability, this might be a good first purchase for someone who feels a desire to own a piece of Cold War history, prepare for possible nuclear disaster, or pick up a nifty new gadget.